This blog is made using Blogger. I love Blogger, it is SOOO easy. It's Blogger that we teach in our seminar: Every RVer Needs a Blog! But, it's not the only blogging system. I've also had a Wordpress blog for a few years. I use it strictly for the geeky stuff we want to talk about - not the personal travel blog stuff. Notice the 'Geek Articles' in the left sidebar here. That comes from our Wordpress blog. It's NOT as easy! But it has a lot more capabilities. In addition to blog posts, you can also create static pages. It can actually be a complete website. And, it can be hosted on your own webhost, unlike Blogger where you have to use blogspot.com. There's always a lingering feeling of discomfort using a free hosting system! If you'd like to check out how Wordpress works, there is a free hosting option at Wordpress.COM. At Wordpress.com it is just as quick and simple to set up a new blog as it is at blogger. The big difference with Wordpress is that there is a private option. You can have the blogging system software installed on your own host. This is available at Wordpress.ORG. Confusing, I know - it's taken me a few years to figure it out! If you use a webhost like GoDaddy.com or Webhero.com or many others, you may see an option to have a Wordpress blog installed on your account. They're talking about the Wordpress.ORG stuff. It started before sunrise, about 6am, in preparation for driving up to Boca Raton to a pavilion on the beach. Friends from a dive club have been meeting here on Christmas morning for years to watch the sunrise. Our efforts were greatly rewarded this morning. Next we got to play Santa with grandkids. We went over to Devon's house and watched the crazy scene of a 2 year old, and a 5 year old tear open the wrappings on dozens of presents. It's so nice to see Devon and Lacie (Dad and Mom) having such fun with their kids. Then we picked up my Mom and Jim's Dad and drove up to West Palm Beach to Jim's sister's for Christmas dinner. Debbie and Bob always outdo themselves. Especially with decorations. More pictures on our Picasa Web album. Just click on any of the photos above, then you can click forward and backward to see more. Merry Christmas to all! I plan to sleep good tonight! Romantic midnight walks in the full moon, and new furniture for sitting at home enjoying our own company. How does that sound? Well, it's better than ... Jim decided to fix our toilet that had been leaking in a pretty disgusting way. Turns out it couldn't be fixed so he ordered a new one. Meanwhile the old one had been removed, just leaving a hole in the floor. When we needed to use the facilities, we had to walk out to the nearest bathhouse in the RV park. Not too bad really, except in the middle of the night, and there really was a full moon out! It took a week for the new toilet to get here. oooohhhh .... aahhhhhhhh - it's really nice. A porcelain bowl this time instead of plastic. And a hand-held sprayer for that extra flush. This is our Christmas present to each other! btw - the text in these pictures was added using Picasa 3's new text tool. The 'show-me-how' video on how to use it is the free feature this month at www.GeeksonTour.com. Check it out. I stayed in bed, drank plenty of fluids and took lots of Coldeze so I could get better. Because we had parties to go to! Lots and lots of parties. Since we're not normally here during the holidays, we don't want to pass up any opportunity to party with family and friends. Some people say they can't get into the holiday spirit when there's no snow and it's 80 degrees. I say 'fiddle dee dee' this is plenty festive for me! I haven't been taking my camera with me because, well, I want to party! 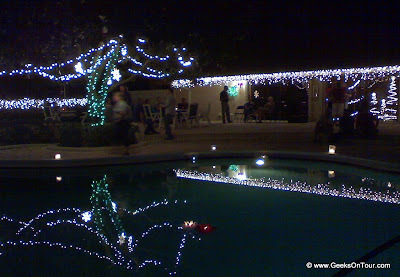 But, here's a shot I snapped with my cell phone at the party in my Mom's complex. Christmas lights around the pool. Much better than snow in my book. This one was just too good not to share! To all our doggie friends living with us fuddy-duddy RVers who stay south all winter long. We're sorry you get deprived of all the fun that snow provides! I try to imagine Odie in this deep snow ... he'd be lost and gone! Actually - I think he'd stick very close to our ankles. He's only seen snow once and didn't much care for it. Not like this dog! Well, it gave me an opportunity to use my new lap desk that I won at the Datastorm rally. Other than that, I can't say much good about catching a cold and fever and staying in bed for the last 2 days. I used the lap desk so I could work on the computer in bed of course! In between naps anyway. One thing I worked on was finalizing an affiliate advertising system. George, of the famous George and Tioga team, agreed to put one of my ads on his site. Thanks George! Check it out and let me know what you think. If you haven't visited his site lately, it's worth it just to see where he's parked in Mexico. 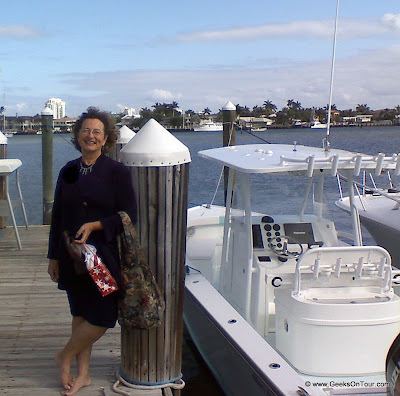 Last Friday, my Women's Executive Club had it's annual holiday party at the Lauderdale Yacht Club. It's been a few years since I was able to attend. I considered it a special treat, and I took my Mom as my guest. I enjoy this group so much - which is why I've been a member for so long. They gave me my 25 year pin at the luncheon! Even though I'm not here much, I stay involved by being the club's webmaster. The hardest part of attending the meetings is finding something to wear. An RVer's wardrobe is limited. At least mine is. I think one of the main differences between a big RV and a small RV (I consider ours small at 30 ft.) is closet and other storage space for clothes. No big deal for Jim and me because we don't care much about clothes ... a couple pair of shorts, a pair of jeans, a pile of tshirts, a jacket, and a bathing suit. We're done. When we're on the road, most everyone we meet has the same fashion sense as we do. But, a holiday luncheon with a Women's group ... that's a bit different. Luckily, I have a duffel bag full of nice, light knit clothes that always look nice. They're a brand name called 'Weekenders' and it's amazing how they can stay folded/rolled up in that duffle bag for years and still come out and look nice. I store the duffel under the bed. Why do I have this duffel bag full of nice clothes? I laugh just thinking about it. Weekenders was one of those direct marketing organizations where you go to a 'party' at someone's house, try on the clothes and buy from the hostess. One of my fellow Women's Executive Club members sold Weekenders - and she introduced me to the business. I liked the clothes, and I thought they'd be perfect for RVers who occasionally need something nice to wear. So, I became a 'consultant' for the clothes. Meaning, I was going to *give* the parties and sell the clothes. This was in 2003, before we actually hit the road. I'm a believer in getting out of your comfort zone, but this was a little too far! My actual title was 'Fashion Consultant.' It was all I could do to keep a straight face! I learned pretty quickly that this was not a line of work for me, and not a good idea for an RV-based business either. Your party needs to have at least a dozen people to make enough sales. In my RV I could have 2! I only did that once ... remember Lynne? I am SO glad I did it though. First of all, it started my friendship with Lynne! She must have thought, "Here's someone crazier than me!" And, second, I got this duffel full of clothes. You see, in order to become a 'consultant' you needed to buy a starter kit. A variety of clothes, some of which I never would have bought on my own. I've had occasion over the last 5 years to wear everything in that duffel bag! I've never had to panic about not having anything to wear. Wedding, funeral, business meeting, or party - I'm ready! Unfortunately, the Weekenders organization recently went out of business. Too bad. I don't want to sell them, but I sure do recommend them. You can find some stuff on eBay and searching for Weekenders, but I think there is a department store brand by that name too - so you have to be careful. In any case, I highly recommend having a collection of wrinkle-free nice clothes to supplement the normal RVer's wardrobe. 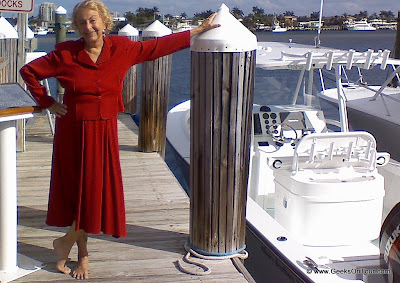 I've been getting together with a lot of old friends and clients here in Fort Lauderdale. Many of them are back in the 'olden times' of the Internet. You know ... 2 - 3 years ago! One friend wanted to have her email be more professional - name@herbusinessname.com instead of @aol.com. We found that her business name was available as a .com and I got her set up with the domain name, and an email for a mere $10/year. She said, "oh good, now I can get rid of AOL, that costs me $12/month. I'll be happy to save that expense." OMG, she's been paying $12/month for the last 2-3 years for nothing! Since sometime in 2005, AOL's email has been free. The only need to pay AOL is if you need them for your Internet connection. My friend here has a cable connection to the Internet, so she's been paying AOL for nothing. AOL didn't publicize this change too much! If you kept paying them after the change, they just figured that you were using the Dial-up service. Just thought I'd mention it here in case any other readers out there are in the same situation. Am I working or am I playing? It's really hard to tell. It's all done in the same motorhome, a total space of 30 feet by 8.5 feet. And, most of it is done sitting at the computer. There's stuff I do for fun on the computer, and there's work too. Only I know the difference! (actually, I don't think I do) I have never been good at time management, but I keep trying. With a laptop I'm learning that I can go somewhere else - the club house or my Mom's house - and it's a little easier to focus on work. By 'work' I mostly mean recording the tutorial videos for our Geeks on Tour online classroom and managing that website. Right now I'm creating a series on the new Picasa 3. I've made some progress, but I have lots more to go. There are now 11 Picasa 3 videos on the Geeks on Tour Picasa Tutorials page. *Sales Pitch**Sales Pitch**Sales Pitch**Sales Pitch* Although there are some free samples, you need to be a member to view all the videos - over 120 of them now, a little over 10 hours worth. You can also buy a gift membership for someone else. Dontcha think that's a great idea? I sure do :-) It's only $39 for a whole year and it doesn't automatically renew - $39 is your total commitment. *End of Sales Pitch! * Marketing is the other business skill I'm working on! Right now I've worked my way up to writing over a dozen articles every month as part of my marketing ... I write a Picasa tip every Tuesday, and an article for RV.net's blog every Thursday. Once a month I write the Geeks on Tour free newsletter with at least 3 articles in it. I've promised another feature article for Family Motor Coach magazine, and recently wrote one for Country Coach magazine. I've retooled my WiFiSavvy.com blog to be a repository for all our geeky articles. That way, they're easily found. They're all categorized and tagged. You can also use the Search feature to find any article by its content. Little by little, I'm making sure that all past articles get added to WiFiSavvy.com - so it's the complete Articles database. Once in a while, I have an idea for an article that isn't in any of our standard categories, so I throw it in on WiFiSavvy too. Like one last week on Mailing Labels for Holiday Cards, complete with a tutorial video. The great thing about being entrepreneurial is that you get to work on your own ideas and see them come to fruition. The bad thing is that you have *way* too many ideas to work on them all successfully. You have to choose. I think that's what time management is all about. Oh yeah ... I'm also doing websites for clients. That's something I actually get paid for! hmmmm, maybe that should be a criteria for choosing what I work on? Ya think? Luckily I did my chiropractor's website in trade for adjustments made neccessary by all this sitting! Ok, I know, I gotta get to work. If I've promised something to anyone out there and you haven't heard from me ... please remind me OK? You would think that, since we're not in travel mode these days, I would have more time, but it doesn't seem to work that way. I have greater expectations of what can be done when we're not traveling and I fill the time up at least twice over! When we're traveling, I at least have the down-time of when Jim's driving and I get to watch the scenery. I don't expect to get anything done then. Unfortunately, I've started using our cell phone tethered to the computer to get online even when we're traveling now. I did turn off the computer on Thanksgiving day. Maybe I'll do the same on Christmas. .. .. n'aaa, how would I track Santa's progress then? For something completely different! This morning, Jim and I spoke at a local Kiwanis club meeting. We didn't speak about computers. Instead of the 'Geek' part, we concentrated on the 'on Tour' part! We had a slide show with pictures showing the process of becoming full-time RVers. From selling our house and all our stuff, to learning about the RV, to campgrounds, rallies, and Natonial Parks. We had about 50 slides, and Jim and I took turns doing the narration. It was a 20 minute talk and it was SO much FUN. People came up to us afterward and said that was the best presentation the club had ever had. We want to do more of that! People are already amazed when they learn that Jim and I live - and work - full-time in a 30 foot, class C motorhome with no slides. So, where does my mother stay when she travels with us? In the mother-in-law suite of course! The cab-over area of this old Safari class C motorhome is amazingly versatile. It's big enough to be our TV room, our library, our workbench and staging area when we need to spread stuff out, and, best of all, our mother/mother-in-law suite! I don't know of a 40 foot class A that provides such a nice guest room! Mom says she loves it up there! She even picked up a book in our 'library' and said, "Let's do this!" The book? Ooooohhh ... would that be cool? Kind of like recreating my first RV trip. When I was 10 years old, my Mom and Dad piled all our belongings into a truck camper. We left Anchorage, Alaska in January and traveled as far as Guatemala where the road got washed out by rain so we couldn't continue. Let's try again?! Don't know what happened to the short one, but here's the full hour video on Cyprus, Jordan, and Petra - at the end. We had also promised to take her on an RV trip somewhere. We decided on just a 2-night trip a short distance away to Lion Country Safari. In addition to the African Adventure Zoo, there is a KOA RV park with a Wi-Fi system we've been wanting to check out. Pretty weird to hear Lion's roaring on the other side of the fence from the campground. It's really a well-done place all around, RV park, Wi-Fi, and free ranging (kind of) zoo.